In 2016, officials from the Amolatar district in Northern Uganda approached Okello Alex* with an offer. They wanted to buy land from him for a prison farm. Okello agreed. But there was an issue: it was not his land to sell. The land belonged to Alemere community—a fact that both Okello and the officials knew well. The land in question was used for Alemere’s group farm. Each year, it was divided equally among a select, rotational set of households in the community. In the past, the farm had been managed by the Cooperative Society. The Society oversaw the distribution of the land, identified which crops to plant, and helped to store and market the produce. Okello had been chair of the Society. Between 2013 and 2015, the residents of Alemere had taken action to improve the protection and management of their community lands, including the group farmland. Like many communities in Uganda and across Africa their status as stewards of the land was undocumented and their management of the land weak. Companies and powerful individuals regularly take advantage of communities like this, grabbing their land and resources and displacing families. 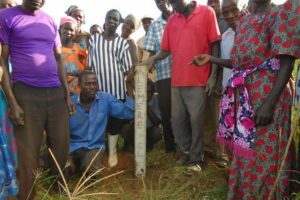 Working with Land Equity Movement Uganda (LEMU), a Namati partner, Alemere residents drafted and adopted bylaws, elected a community land management committee, and harmonized and made agreements over their community land boundaries. Alemere residents gather to elect members to the community land management committee. During the bylaw drafting process, there were debates as to whether the group farm belonged to the community or to the Cooperative Society. LEMU and community members sought clarification from the district. The District Commercial Officer confirmed that the land belonged to the community. The only asset the Society had was a store which had since closed down. The Society itself, he further noted, was now defunct. Minutes from a 2012 community meeting with the district officials confirmed it. Okello had been a key participant in the process, even officiating the election of the community land management committee. So it came as a cruel surprise to the community to learn that a year later, he was the one who was working against their interests. It is alleged that he was offered money and gifts in exchange for securing the land for the prison farm. Okello took to walking around Alemere with a file, claiming that the Society had a title deed for the land. He hand-picked members for a new management committee—who did not reside in Alemere—as means of proof of the Society’s continued relevance. He denied his involvement in the community land protection process and said the decision had been that the community owned the communal grazing land, not the farmland. He threatened to have any community member who resisted the sale arrested. The residents of Alemere were upset. During the community land protection process, they had come to understand the value of their land. Fortunately, they also had learned how to use the law to protect it. They came together, reviewed their rules, and devised a plan to stop the sale of their farmland. The first step was to meet with their Member of Parliament and request that he contact the Ministry of Lands, Housing and Urban Development to determine if the community’s land was ever titled in the name of the Cooperative Society, as Okello claimed. No such record was found. With this evidence, the community land leaders, with the help from their district council representative, called for a meeting with the district authorities. The community leaders informed the officials that their MP had verified there was no title for the farmland in the name of the Cooperative Society. They presented the officials with a copy of their constitution/bylaws that governed and regulated the use of their shared grazing and farm lands. Olal Tom, the chair of the land management committee, read the sections on governance. He explained that Okello had agreed to the constitution before helping the community to formally adopt it and elect leaders. With the power of law in their hands, the community had a firm case. The district officials conceded. The sale was terminated. The community was thrilled—and grateful. “If LEMU had not opened our eyes to see how important our community land is to us, we would not have done anything to protect it and [Okello] would own a plane now; he would have succeeded to sell our community’s land to the district,” says Alaba Fatuma, treasurer of the community land management committee.